If your savings goals fell short of what you wanted last year, start off on the right foot on the very first day of the new year. It’ll only cost you $1. By the end of the year you could have saved $1,368! Make the money saving process a little easier on yourself by saving the amount of dollars that correspond with the week of the year. For example, this is the 5th week, so I’m going to put $5 into my savings account. I will tell you that this method can hurt a little bit at Christmas. This savings method is designed to ease you into the discipline of saving, but that leaves you giving around $50 every week in December (which is hard at Christmas). My play to do the calendar in reverse, checking off from the bottom to the top… I can handle $5 per week come Christmas! 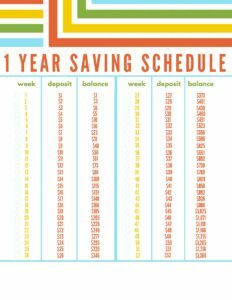 I’ve made a printout for you to keep track of your savings and to visualize how much money you can save ($1,368 starting this week). I started my chart at week 5 in case you’re like me and you considered January your trial month. If you don’t want to be behind, just put an extra $10 in your account to catch up. See you didn’t miss much in January!